Homepage > Product > Ready for Microsoft Azure Stack? Rubrik Is! Today, a developer that enjoys the robust features and ease-of-use of public clouds is often constrained by the lack of comparable services in most private cloud solutions. Likewise, cloud operators who develop workflows for managing their public cloud infrastructure find they must create new workflows to manage their private cloud environment due to incompatible tooling and APIs. To address this gap, Microsoft created Azure Stack, which provides public cloud capabilities inside a user’s data center. Unlike most vendors, Microsoft didn’t attempt to create a private cloud platform that was compatible with public cloud. Instead, they built Azure Stack by instantiating Azure in a private cloud form factor as an extension of its public cloud. The best way to think about Azure Stack is as an on-premises extension of an Azure Cloud subscriptions. Microsoft’s goal with Azure Stack is to give users the same experience and capabilities as Azure Cloud, with common services, APIs, and interfaces. To achieve this goal, Microsoft makes a core set of Azure services available in a certified hardware stack running Azure OS, which can be purchased and consumed as an integrated solution. This pre-integrated stack can be deployed in a customer’s or a service provider’s data center. Once an Azure Stack system is installed, configured for network access, and given the appropriate security credentials, users consume it as they would the Azure Cloud. The Azure Stack approach helps pave the way for Microsoft to become a dominate hybrid cloud provider for the enterprise. Since Azure Stack is an on-premises extension of Azure Cloud, it makes sense to consider a unified approach to protecting data for both platforms. 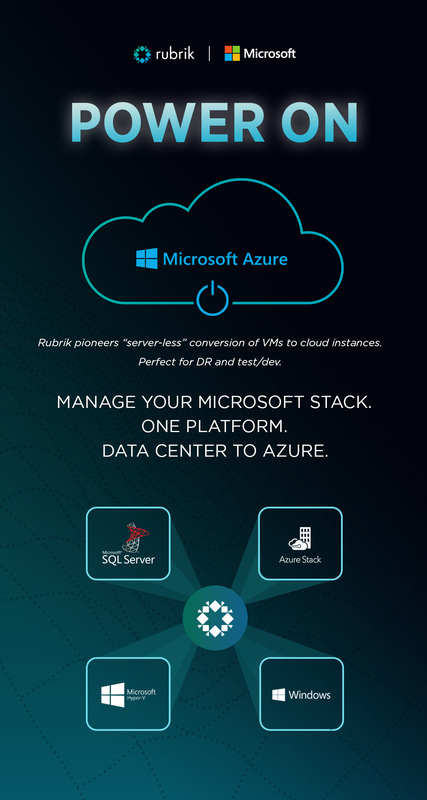 As a certified partner, Rubrik has been working with Microsoft to ensure that customers can leverage the Rubrik Cloud Data Management platform to protect their data across Azure and Azure Stack. For more details on what is supported from a data protection standpoint with Azure Stack, please read Microsoft’s blog post: Protecting applications and data on Azure Stack. We are excited about our partnership with Microsoft and the value it provides to our customers through integrating the best cloud data management solution with a world-class hybrid cloud platform. The partnership around Azure and Azure Stack further extends the breadth of integration and support Rubrik has across the Microsoft portfolio. To learn more about Azure Stack, we recommend listening to episode 97 of the Datanauts podcast on Unpacking Azure Stack Hybrid Clouds by Rubrik’s Chris Wahl. You can also read more about it here.